PITTSBURGH (AP) — The St. Louis Cardinals claimed right-hander Tyson Ross off waivers from the San Diego Padres on Sunday. The 31-year-old Ross is 6-9 with a 4.45 ERA in 22 starts this season. He will join the team during its upcoming series in Miami. The last-place Padres could have pulled Ross back from waivers when the Cardinals claimed him, or worked out a trade. But they opted to let him go to St. Louis, saving his salary for the remainder of the season. The Padres also lost right-hander Jordan Lyles on a waiver claim by Milwaukee. Ross broke into the majors in 2010 with Oakland. 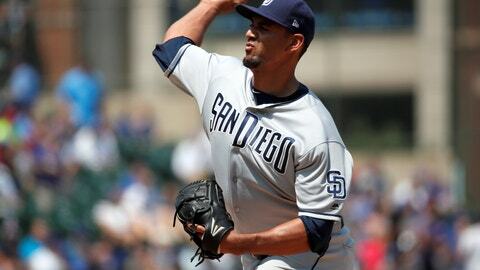 He had his best season with San Diego in 2014, making the All-Star team and going 13-14 with a 2.81 ERA in 31 starts.